View More In Cars & Trucks. Automotive Steering and Suspension, published as part of the CDX Master Automotive Technician Series, arms students with the basic knowledge and skills they need to accomplish a variety of tasks in the shop. Taking a "strategy-based diagnostics" approach, this book helps students master technical trouble-shooting in order to address the problem correctly on the first attempt. 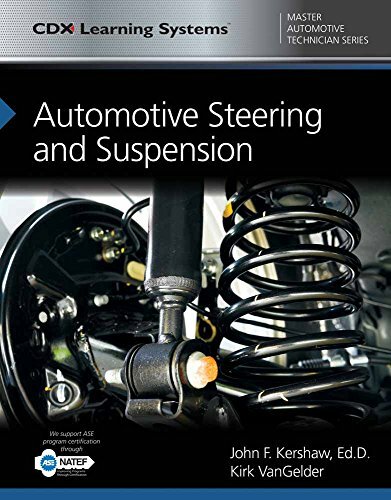 Written in an accessible and engaging style by a highly experienced automotive instructor, this text prepares students to handle any problems related to steering and suspension that they might encounter. Organized around the principles of outcome-based education, CDX offers a uniquely flexible and in-depth program which aligns learning and assessments into one cohesive and adaptable learning system. Used in conjunction with CDX MAST Online, CDX prepares students for professional success with media-rich integrated solutions. The CDX Automotive MAST Series covers all eight areas of ASE certification.